Many people think that they need to reinstall Windows after forgetting the password to log into computer. Actually that's not the only way to help you out. 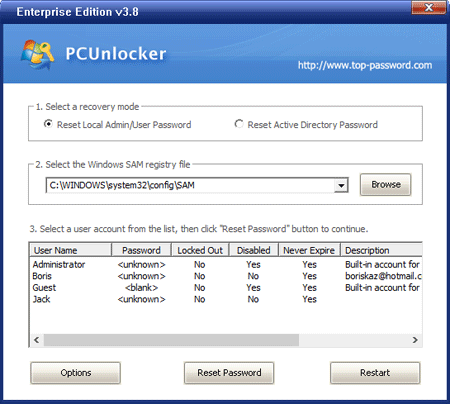 The easiest and fastest way is to reset your Windows password with PCUnlocker. It also can save you hundreds of dollars if you don't have a system reinstallation disk and need to purchase one for it. To reset lost Windows password, you only need to create a password reset disk to help you get into the locked computer and perform the password resetting. All this takes you 3 steps. Download the PCUnlocker and save it on any computer you have access to. Unzip the downloaded file, there should be an ISO image file: pcunlocker.iso. You can use the BurnCDCC program to burn the ISO image to a blank CD/DVD, or burn it to a USB flash drive using ISO2Disc. 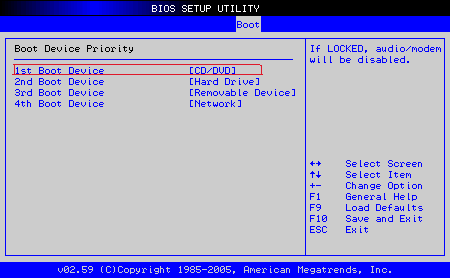 Insert the newly burned CD/DVD or USB flash drive on your locked computer and restart the computer. The boot loading screen should appear immediately. After completion of boot process, you see the main window of PCUnlocker. Reset Local Admin/User Password: Select your Windows SAM registry file, the program will automatically list all user accounts. Select a user account and click the Reset Password button to reset the password to blank. Reset Active Directory Password (For domain controller only): Select your Windows Active Directory database (ntds.dit) file, the program will automatically list all domain accounts. Select a user account and click the Reset Password button to change the password to Password123. Click the Restart button and take out the password reset disk. Restart your computer, you'll find you can get into the computer directly without being asked for password. Sounds good?Go ahead and try PCUnlocker today!